What am I seeing here? I asked myself. It was invisible to all but me. This dying woman was perhaps the most untouchable person in the world and yet Dr. Brantly was touching her. And he was not just touching her physically, but emotionally and spiritually as well. Who was I that I should be granted the privilege of witnessing this? It was somehow both utterly tragic and supremely glorious. When, despite following protocols to the best of their abilities, Nancy Writebol and Dr. Kent Brantly were diagnosed with Ebola, she knew how they would suffer as they fought this deadly disease. 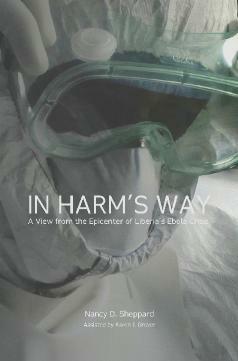 But, “In Harm’s Way” is more than a book about ELWA Hospital’s Ebola ward, it is the story of Liberia itself. Told in the sympathetic voice of one who cares for the country and her people, Nancy explains the multiple societal and cultural factors that have exacerbated the Ebola crisis in her adopted home. 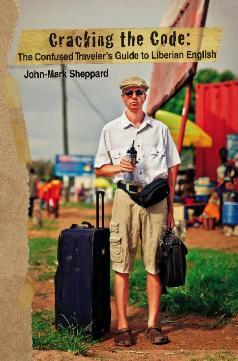 Warm and human, this book takes you into Liberia’s epicenter of the war against Ebola. You will not emerge the same. To order the paperback edition click here. When Mark and Nancy Sheppard began missionary service in Liberia, Nancy had no idea what God would ask of her. Their idyllic first term was followed by the Liberian Civil War and a nightmarish year working among Liberian refugees in the Ivory Coast. Conditions were difficult, expectations overwhelming and the tensions of the war at their doorstep. Fear, self-pity, resentment and depression haunted her. God used Nancy's difficult decision to follow her husband's leadership and remain in refugee work to begin an amazing spiritual journey—one that led to a clearer understanding of biblical womanhood as well as a deeper relationship with the Lord and with her husband. The book chronicles Nancy's journey to true peace in the midst of very difficult circumstances. As God teaches her about genuine service, submission, sincere prayer, reverence and humility, she is totally and completely transformed. The scenarios are unique to Nancy, but every seeking Christian can fully identify with the spiritual lessons. Click here for a YouTube slide show of chapter 2. As Nancy reads, pictures are shown from our first term in Liberia. 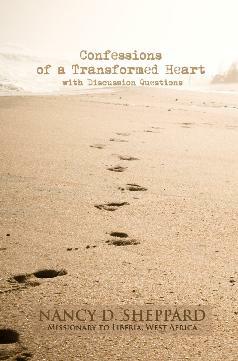 In Chapters 9 and 10 (part 1 and part 2), Nancy tells how God used a series of losses to draw her to Himself. 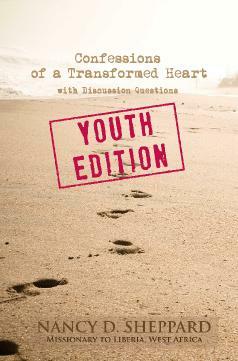 The “Youth Edition” of Confessions of a Transformed Heart is an edited version of the original book. It is perfect for younger readers who can benefit from the spiritual lessons, but for whom some of the more graphic explanations of the war and Liberian culture may not be appropriate..
To order the “Youth Edition” (paperback), click here. To order the Kindle Edition, click here. Cuando Mark y Nancy Sheppard comenzaron su trabajo misionero en Liberia, Nancy no tenía idea alguna de las cosas que Dios le pediría. El primer periodo de tiempo que estuvieron en el campo misionero fue tranquilo, pero fue seguido por la Guerra Civil en Liberia y un año horripilante de trabajo con los refugiados liberianos en Costa de Marfil. La situación era difícil, las expectativas eran abrumadoras y la tensión de la guerra se encontraba en la puerta de su casa. Miedo, autocompasión, resentimiento y depresión la perseguían. Dios usó la difícil decisión que tomó Nancy de seguir el liderazgo de su esposo y de continuar trabajando con los refugiados para llevarla en un asombroso viaje espiritual— uno que le permitió tener un entendimiento más claro sobre la femineidad bíblica, al igual que tener una relación más cercana con el Señor y con su esposo. El libro registra el viaje que toma Nancy para llegar a una verdadera paz en medio de circunstancias muy difíciles. Mientras Dios le va enseñando sobre qué significa un servicio genuino, la sumisión, la oración sincera, la reverencia y la humildad, ella es completamente y totalmente transformada. Las escenas presentadas son particulares a la vida de Nancy, pero cualquier cristiano en búsqueda de algo más puede identificarse plenamente con las lecciones espirituales que ella aprende. Por favor haga clic aquí para ordenar la versión de bolsillo. Por favor haga clic aquí para ordenar la versión Kindle. Por favor haga clic aquí para ordenar la Edición Juvenil. Ten-year-old Jason, the son of missionaries in Liberia, doubts the effectiveness of prayer when he loses his prized toy truck and thinks he might lose his pet mongoose. 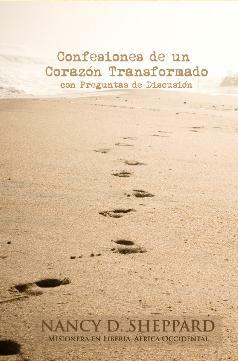 To order the iBook version, click here. Jason Steward, un niño de nueve años de edad, se convierte en el dueño de una mangosta bebé, y está seguro de que podrá mantener a su nueva mascota fuera de travesuras y problemas. ¿Cuán difícil puede ser? Pero Pepper, su mangosta, está tan llena de vida y picardía que se parece mucho a la pimienta picante liberiana. Jason rápidamente se encuentra frente a un dilema que solamente Dios, por medio de la oración, puede resolver. Pero, ¿Dónde está Dios cuando Jason ora? 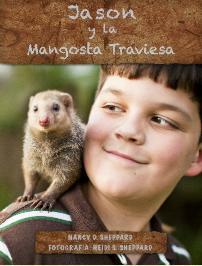 Escrito por la autora-misionera Nancy Sheppard, “Jason y la Mangosta Traviesa” es un cuento encantador que nace dentro la misma selva de Liberia, África Occidental. Fotografía hermosa hace que este cuento misionero tome vida y sea un encanto para lectores de todas las edades. Por favor haga clic aquí para ordenar Jason y la Mangosta Traviesa. To order the paperback book, click here. Author Nancy Sheppard had never heard of female genital mutilation (FGM) until she arrived as a missionary in Liberia, West Africa, in 1986. In the decades since, because of her ongoing ministry among the affected women, she has studied the subject intensively. As a result, she has gained an understanding of the heart issues which lead to this painful and life-altering cultural practice. 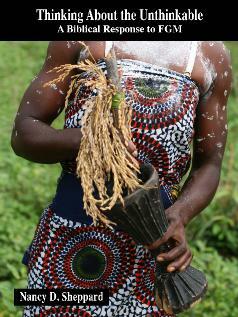 Unlike the past, in this age of international travel, FGM now has the potential to touch anyone anywhere in the world. More and more often pastors, lay leaders and others in the West find themselves faced with questions and concerns about FGM—issues formerly reserved for those living in distant cultures. Thinking About the Unthinkable: A Biblical Response to Female Genital Mutilation explains what FGM is, who is affected, the physical consequences and the reasons given by proponents for practicing female genital mutilation. The author uses scripture to identify the reasons this deeply embedded cultural practice is wrong. The last portion of the book focuses on how to counsel victims and potential perpetrators. Chapters include, “Instilling Biblical Hope After FGM,” “Idols of the Heart and FGM” and “Fear and Female Genital Mutilation,” etc. The author’s goal is to prepare Christian counselors— professional and lay—to reach out with God’s grace to those hurt by female genital mutilation.